Romitaman Original Comic Book Art :: Private Collection :: Amazing Spider-Man #109 p 1 SPLASH 1972 SOLD SOLD SOLD! by artist John Romita Sr. This Splash is ALL DRAWN ARTWORK! ****** Also...as an extra bonus... The title logo AND the word "SPIDER-MAN" at the very top are all HAND DRAWN! This superbly detailed 1972 Amazing Spider-Man SPLASH page was penciled "AND" inked by the great John Romita, from the classic story titled: "Enter... Dr. Strange!" 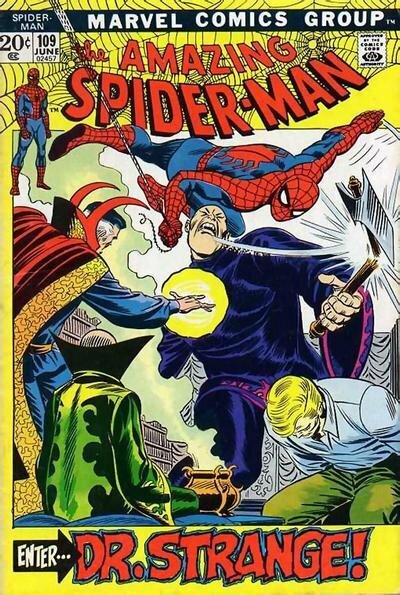 This nice SPLASH features a huge image of a confused Peter Parker wondering how he can save Flash Thompson from the big Vietnamese giant, without giving up his secret identity to Gwen Stacy. Beautifully drawn images here of Gwen Stacy, Flash Thompson, and the villain of the story in the background behind Peter Parker also! This splash is one of the very FEW KNOWN amazing Spider-Man SPLASH pages from Jazzy John Romita that were actually penciled AND INKED by him! John Romita only penciled and inked "10" small art splash pages for this ever classic Amazing Spider-Man run: (ASM 108-115,117 and 119. THAT'S IT!) 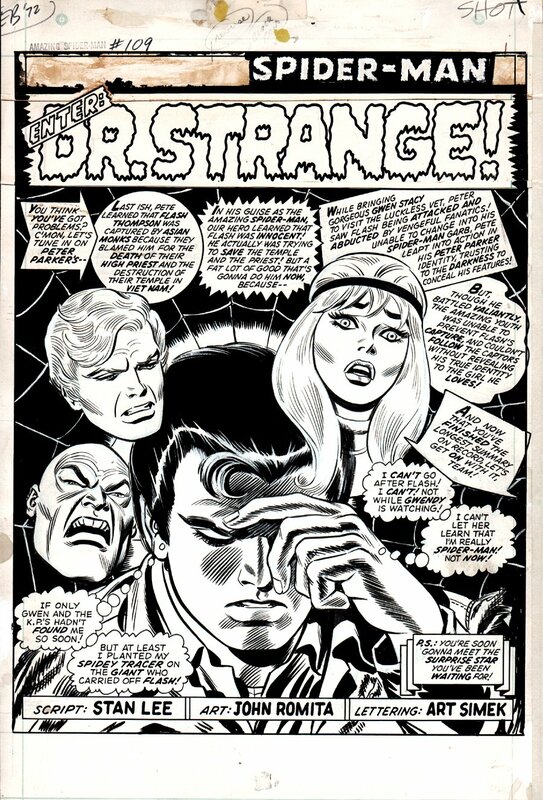 and I don't believe a small art john Romita Spider-Man splash page has ever been sold publicly other than the Amazing Spider-Man #117 ALL JOHN ROMITA Splash we have for sale here on our website) Don't miss out on this VERY RARE chance to own a John Romita penciled AND INKED "AMAZING SPIDER-MAN" SPLASH PAGE! ALL HIGH end pieces of art, including this one, are able to be purchased with VERY fair time payment plan options, and trades are always considered towards this and "ANY" art on our website! Just send us an email to mikeburkey@aol.com and we can try to work something out.